Today's Draw: Hung Man in the Success position from the 1969 Tarot and the Deck of 1000 Spreads. When you go for something you want, do you have a hard time letting go? Are you fine with whatever outcome may come? Or do you get your hopes up, then are devastated and held back by defeat? The lwb (the little book that comes with a tarot deck) for this deck portrays the Hung (Hanged) Man as someone who lets all the demons and fears seep out of his head. It's a card of transition, somewhat different from the sacrifice or different perspective we're used to having the Hanged Man represent. 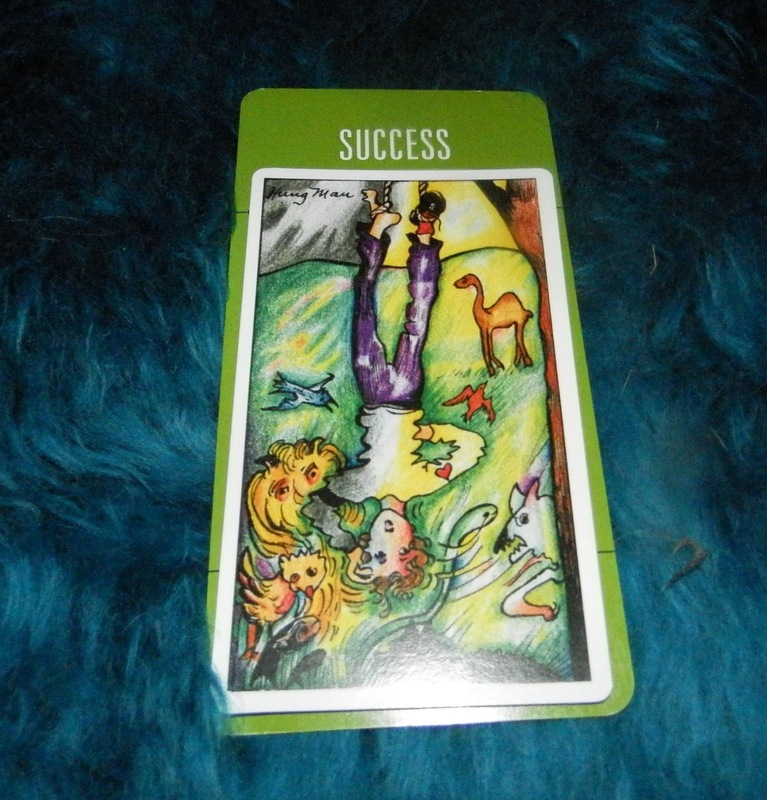 Coupled with the Success card, it says that success depends on this transition time between laying the groundwork and seeing success. It requires you to let go of fears and over-thinking and just wait. This is something I've learned over the years. I do my part and let go of outcomes. If I don't get what I think I want, I tell myself it's all for the best. So, in other words, all the clients that never hired me for work...I got lucky because they would have been a pain in the arse. Or something like that. That's what I tell myself. I'm grateful for both what I receive and what I don't. Back in my agency days, the powers that be used to try extra hard all the time. A proposal was followed by a gift basket with a cutesy theme that basically said, "we want your business". I get the reasoning of trying to stand out. But I also see it as a desperate move that says "we're not good enough on our merits alone. So here's some fruit." It's almost always based on fear and a desire for the money. If they hire you because you sent a gift basket, they're going to expect you to always be behind in the power differential, running to catch up. You're not approaching them as a partner, so they won't see you as one. If they hire you because you sent a fruit basket, it's because that kind of pandering works on them. If they hire you based on your merits alone, then you've already proven yourself worthy. You meet your client on a more equal footing, which is as it should be. I would never regret business I lost because I didn't send a fruit basket. And not sending a gift basket is the only way to know if you're being hired on merit alone. One thing I can say for certain is that the clients I've regretted in the past were all ones I took on out of fear, primarily fear over not having enough money. The same rule applied to my dating life, though I didn't follow it there. If the man didn't call, I'd tell myself "he must have lost my number. He must be too shy. This is modern times, I should be able to call him confidently and not feel like I'm being too needy." Well, of course that always backfired. Nothing that ever came out of a place of insecurity, fear of rejection or desperation ever resulted in success. So this applies to pretty much every area of life. When we become too attached to an outcome, try to force an outcome or get too anxious about a situation, we often screw with our own success. I'm not suggesting you don't try. But I am suggesting that, once you've tried and done your best, don't keep going back to polish and question. The key is knowing what is coming from a place of power and what is coming from a place of insecurity. Second-guessing is almost always coming from a place of insecurity. When you begin to doubt your effort, that's your cue to let go and let god. Then be grateful for whatever outcome comes.